Liberal Millennial Asks: Is There Any Single Objective News Source? RUSH: We start in Brooklyn. This is Rachel. Great to have you. 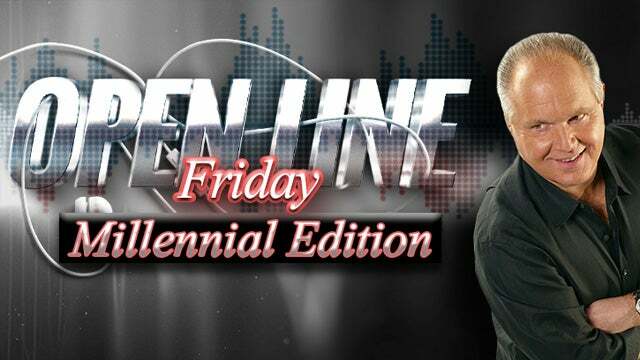 You’re up first today on Open Line Friday. Hi. RUSH: — you’re a liberal but you still listen here. CALLER: Yes. So actually, it’s a great story. My grandmother is a huge, huge fan of yours. I want to give her a shout-out. That’s Florence in Brooklyn, my grandmother. I love you so much. She leans very politically towards your side. She’s a little bit more open-minded, but definitely a Republican. She is just the best, and she’s a huge fan of you, and she’s been telling me to listen to you because she agrees with so much of what you say, and she wants me to kind of adapt that opinion or, if not, kind of integrate that into my political beliefs. CALLER: So I became a huge fan of you. I listen to you on Fridays because I get home from school early. RUSH: You know, this is… Rachel, this is one of the best questions that I’ve had in a long time. It’s really intriguing. RUSH: So I’ve been thinking about that. (chuckles) You know, I’ve been trying to think. You know, I read and consult many sources during the day and during the week, and I’ve been trying to sit here and think, “Is there one place that I go to that I trust implicitly, that if I see it there, I don’t have to confirm it elsewhere; I don’t have any doubts about it?” You know, the answer to that is, “No. There is not a single place that I go.” There are some better than others. But I think everything’s become so bifurcated today — “polarized” might be a better word for that — that many people seek out media which confirms what they already think. And I think many people… I don’t mean to be insulting you on this. Many people on the left really shelter themselves and closet themselves off from things in the media where they know they’re not gonna hear things they agree with. You don’t. You listen to this program at least once a week. CALLER: I really like listening to your point of view. RUSH: — ’cause I know what conservatism is, and I know what my take on the news is instinctively, combined with my years of being alive, which add up to knowledge and experience, which then inform my opinion. But I spend a lot of time reading the left to find out what they are really thinking about things. It helps me too this program. It helps me educate listeners as to what the left thinks. So really it’s I trust myself and my judgment to know what I’m reading is factually true or not based on the countless years I’ve been doing this. Now, can you hang on? Because I’m not through with this, and I want to get your reaction to it. Can you hold on a little longer? CALLER: Yeah, of course. Yeah. RUSH: Good. We have to take a break because I’ve run out of time in this busy segment. RUSH: Well, my experience is that liberals when they call here are not happy. They’re angry at me or they’re loaded for bear. You sound very bubbly and effervescent. RUSH: But her point is her grandmother is big fan of the program and has asked her to listen. She does. She’s still a liberal but she listens once a week, and she’s asked me if there’s one go-to place for straight factual news that isn’t tainted or biased, and I told her I really can’t think of one. If I start mentioning names of places, I’m gonna get some grief from people for leaving some out. I probably couldn’t mention all that I use. Some are better than others, Rachel, but in terms of is there a single place out there which everybody acknowledges is just straight down the middle and is not ideologically driven, tainted? I don’t think it exists, at least nationally. CALLER: Isn’t that sad? It’s sad. RUSH: Well, maybe it is, but it is what it is. That’s another thing: Reality is what is. So how do you deal with it is the point. I mean, that’s for everybody. RUSH: I mean, you don’t want to be wrong, do you? RUSH: You don’t want to believe things that are not true, do you? CALLER: Absolutely not, which is why I listen to you, I listen to CNN, I look on Twitter. I make my own conclusions. I do definitely shop around, but I definitely do want to know. Well, obviously, you’re saying no. You’re saying the best advice is really to just keep your eyes open. RUSH: Well, I don’t want to be wrong, either, and I certainly… There’s nothing in it for me to lie to people about what I think. I’ve got a large audience here, and there’s not one benefit to me for lying to them about what I really think in my core. I mean, I do satire or parody, but when it comes to being serious there’s no point in lying. I’ll lose them if they think I’m unserious or dishonest. But let me ask you this. On a day-to-day basis, how confident are you that what you believe and know is right, versus how much doubt do you have about what you know? Like, are you pretty confident that what you think of Trump is right, or do you have some doubts about maybe some things people say about him that you listen to? CALLER: So being a debater on my school’s debate team, I’m trained to take what I know and believe it. That is the truth and believe it until the end, and that “is,” and what I say is the truth. Unfortunately, with today’s media and all this fake news, all this smoke and mirrors in the media, making concise decisions about what is accurate and what is not is very difficult. And it has come to the point where I do doubt some of the time, you know, what do I actually think about Trump? If what’s actually going on with Trump is what the left media sources saying about Trump, is that accurate or if it’s something else completely. RUSH: Okay, let me… That’s good. Let me share an example, then, with you. Let me give you some of the places that I go. And, by the way, if you just want news aggregation, if you’re just looking for a clearinghouse, there’s nothing better than the Drudge Report. The Drudge Report doesn’t do editorializing. It just picks stories — some of them left, some of them right. There’s an opinion, prevailing opinion that Drudge liens to the right in the stories he selects. But he links to plenty of story unfavorable to conservatism and Trump and so forth. But when I peruse what I consider to be conservative news sites, websites, I have to be honest with you: I very seldom think they’re wrong. I very seldom do. And when I get into their opinion pieces, I may disagree with them, but I don’t think that they are making their errors because they are dishonest about what they’re interpreting. But when I read Paul Krugman of the New York Times… Honestly, Rachel? RUSH: The first thing Paul Krugman wrote after the election was the stock market is going to crash, the economy is going to crash, the country doesn’t want Trump. American business is going to panic, and they’re gonna take their money out of America and out of the stock market — and the exact opposite has happened. RUSH: So I don’t believe Paul Krugman, whereas I do believe other conservative economists. I just don’t believe Krugman, and I don’t believe much of what I see on CNN. Well, it’s not that. It’s just that I know with CNN, CNN’s on a mission to destroy Donald Trump. RUSH: So I watch CNN, when I do, I have that as the ever-present knowledge and awareness that then flavors what they do, what they report, what they say, and the guests they have. Let’s look at the Russian-trump collusion story. 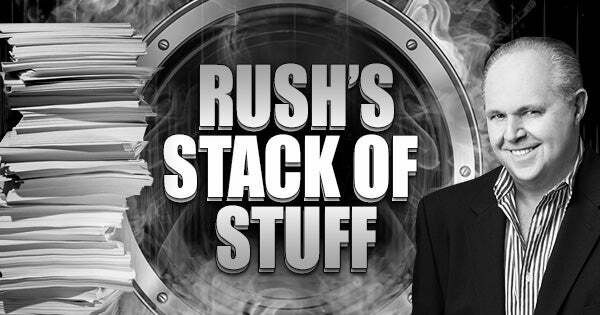 RUSH: The factual aspect here is there wasn’t any. That hasn’t been a shred of evidence produced. Do you believe Trump colluded with Russia? CALLER: I honestly don’t know. Again, I can’t give you an answer. RUSH: Why don’t you know? Where does your common sense enter this mix that we have. RUSH: You’re an informed woman, obviously. CALLER: I try to be. (chuckles) I try to be. RUSH: Well, you are. I can tell that you are. You have opinions. You’re intelligent. RUSH: At some point in all of this, you have to form your own opinion of things and then things that you see get measured against what you’re pretty sure of, which will then help you to accept or reject them. Now, the-Trump-Russia collusion story, you could easily say to me, “Well, there isn’t any proof that he didn’t do it.” Well, we’re not out here proving negatives. I didn’t start this. They did. They made the allegation that the reason this election happened was because Trump cheated, but we find out it was Hillary that was working with the Russians. It was Hillary that crafted this dossier and had it written. It’s opposition research. This is known. This is not under dispute. It is known. So it’s also known that they haven’t been able to produce a shred in two years of any evidence that Trump worked with the Russians to steal the election from Hillary Clinton. Yet, I would venture to say that people who only read the New York Times or Washington Post or watch CNN or MSNBC are convinced that Trump stole the election. I look at that and say, “That is brain-dead.” That is denying reality, and it’s reality and it’s reality and self-confidence being subordinated to political desire, partisan desire. RUSH: Wait, wait, wait. Wait a minute. The way Trump what, it’s not hard to believe? What did you say, the way Trump…? RUSH: Oh. The way Trump is depicted, it’s not hard to believe he would have cheated. RUSH: Wait a minute. Why is it fine the way Trump…? Why can’t the way Trump is depicted be wrong? RUSH: Free speech… Right. Free speech does permit you to make a fool of yourself. RUSH: But free speech does not require anybody to listen to you, and it certainly doesn’t require you to believe them. CALLER: No, but hearing those arguments, sometimes it makes sense and sometimes you do want to believe them. They might be wrong; they might be right. RUSH: Which arguments have you heard that you want to believe that Trump colluded with Russia to steal the election? RUSH: You don’t sound stupid. You don’t. Don’t worry about that. We don’t let stupid people on the air. Just like Trump doesn’t want stupid people admitted in the country, we don’t let ’em on the air. You’re not stupid! This is the thing. You’re not stupid. This is my whole point. 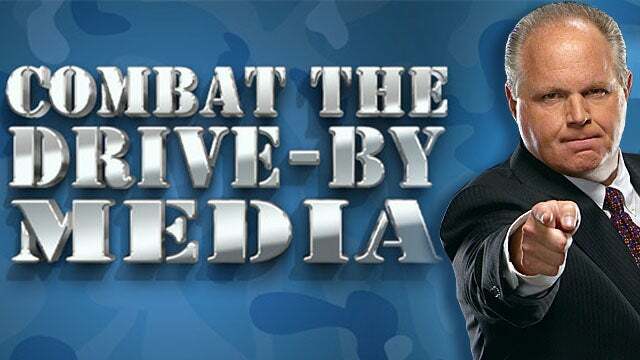 You probably are much smarter than you think you are, and you probably have the ability to be much more confident of what you know and believe than you’re willing to allow yourself to be because the media is the media. “You know, if it’s in the New York Times, there it is! It’s right there on the page. How can I — Rachel in Brooklyn — say that that’s a bunch of garbage?” But you can if it is. CALLER: — concrete proof. I mean, like you said, there is actual concrete proof that Hillary did tamper with the numbers, and you’re saying that there’s no proof — there’s no evidence — that Trump did. But until we have concrete evidence that he did it, how can we say he didn’t for a fact? RUSH: No, but it’s more than that. You never have to prove a negative because you can’t. It cannot be proven somebody didn’t do something. Not the way this is. I mean, look, if you have three people all out doing something and they all witness what happens, and one of the three is lying, yeah, you can prove that. But in this sense, this is like a legal case. We have a special counsel here. We have a grand jury. Where he may end up in court here. Donald Trump can’t be forced to prove what he didn’t do. It’s up to them to prove that he did it, and they haven’t because they can’t. RUSH: If you’re waiting for Trump to prove he didn’t do it, then you’re gonna be waiting for the rest of your life, because on what basis…? What could be produced that would make you confident that Trump didn’t do it? RUSH: But, see, wait a minute. Nobody’s trying to prove Hillary did anything. RUSH: Wait a minute. No, wait, wait. Nobody’s trying to prove Hillary did anything. She’s not being investigated. That’s outrageous! Hillary is not being invest, that we know of. CALLER: But we know she’s guilty. RUSH: Well, yeah, she’s guilty, but nobody’s charging her with anything, nobody’s pursuing her. There is no investigation. RUSH: The FBI in fact did everything they could to shield her. We know this. It’s not arguable. We have the texts from appreciate Strzok and his paramour. We know that they were doing everything they can — Comey was doing everything — because they thought she was gonna be elected. They didn’t want to be on her bad side. They were doing everything they could to exonerate her from doing anything wrong. We know this. It’s just a question of whether you have the confidence to believe it based on how much it conflicts with your political/ideological position and what you want to be true. All of this… Rachel, here’s the thing. What I’ve just described for you, all this, is what I go through with practically everything story before I say anything about it on the radio. Now, I’m able to do this in matter of three minutes when I’m doing show prep and working, because I have a lifetime of work of collecting knowledge. I have a knowledge base built on 60 — well, let’s say 50 — years of intense paying attention to news events and everything else that happens in my life for 50 years. I’m 67. I also am blessed with a good memory. But more importantly, Rachel, I know my heart. I know what my core beliefs are. I know exactly what I believe, and I’m able to admit when I’ve been wrong, and I do not want to be wrong. It doesn’t help me, it doesn’t promote me, it doesn’t accomplish a thing to be wrong. All I’m saying is, since there isn’t a central place that you can go that is untainted in the media for news — straight, factual news… In fact, I don’t think there’s any straight, factual news anymore. I don’t think the media today is news. I think most of the media today is about damaging Trump while, as a secondary objective, advancing the Democrat Party’s agenda. In fact, I know that’s true. See, this is the thing: I know that. And knowing that when I read their media and watch their TV, is that principal premise confirmed? Yes. Every day. It is confirmed. When I watch the way they go after Trump, when I watch the way they don’t go after Hillary, when I watch the way they circle the wagons to protect each other and themselves, there’s no doubt. You can do the same thing. You can get to the point where you just have learned enough and you’re confident enough of what you believe that you can read anything and be open to it being true or false. You don’t need to be totally dependent on one news source for the truth because you can’t anymore. That you have to do yourself, and living and amassing a database of knowledge combined with your own core beliefs — and then your opinions which derive from all that — you’ll be in fine shape. And you can be the arbiter of what’s right and wrong as it relates to you. As long as you’re open about it. If you think you’re right about something and something happens to show you’re wrong, admit it. If you’re wrong about something and then something happens to show you’re wrong, you gotta be willing to say, “Oops! I was wrong. The other side’s right.” This is called being curious. It’s called being objective. It’s having a dedication to getting as close to the truth as you can, and that’s up to all of us individually. So I really thank you. This has been a great, great, great, great question. What are your primary news sources that you look at now? CALLER: I do watch CNN occasionally. A lot of what I make out is — I’m sorry — from Twitter. It’s from what I read. It’s from the highlights. And although I wish that that wasn’t the way it was, time sometimes doesn’t allow me to do as much research as I wish I could. RUSH: Well, you know what? This is my point: I don’t do that much research. My life is the research, and I’m not trying to be funny or anything like that. I’ve been doing this 50 years. I have amassed a credible amount of knowledge. I’m blessed with a good memory. Now, I don’t do Twitter. The reason I don’t do Twitter is because Twitter has been used to literally try to destroy my business and career. I think Twitter is, on balance, a sewer. Other people like it and use it, but I don’t. I have no use for it, even though it’s increasingly popular social media. I think Twitter is a problem. I think Twitter is like a Svengali. It’s where people sequester themselves, and they only expose themselves to things that are gonna make ’em feel like what they think is right. They don’t want to be challenged. They don’t want to have anything intrude on this little cocoon of safety they have constructed and live. Facebook is much the same. But they’re there. They’re not going away. That’s just me personally. I have to go away now, though. I appreciate the call. I really do. RUSH: You know, our last caller, Rachel in Brooklyn, was really great, folks. Let me… You know, Millennials face incredible peer pressure. I mean, it is everywhere, and the peer pressure they face is to hate Trump. Late-night comics, social media. You heard her. She mentioned Twitter. Friends? It’s really hard to think clearly with that kind of peer pressure bombarding you each and every day. People like Rachel, I’ll bet you, are bullied to conform, whether it’s Trump, whether it’s climate change. And she revealed that pressure. She was calling here for assistance. She wanted to know how to break out of all of this peer pressure. And she was great. She really was.